Karl Platt leads teammate Urs Huber down a rough descent on their way to winning Stage 1 of the Momentum Health Tankwa Trek, presented by Biogen on Friday. 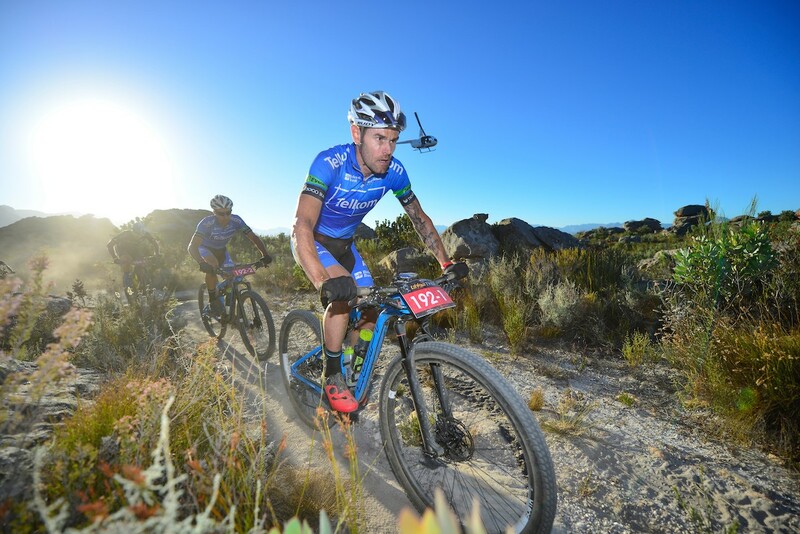 Team Bulls riders, Karl Platt and Urs Huber, charged to a dominant victory on Stage 1 of the 2017 Momentum Health Tankwa Trek, presented by Biogen on Friday, getting their title defence of the world’s most prestigious three-day mountain bike race off to the perfect start. The first women home were Sweden’s Jennie Stenerhag and Switzerland’s Esther Süss. 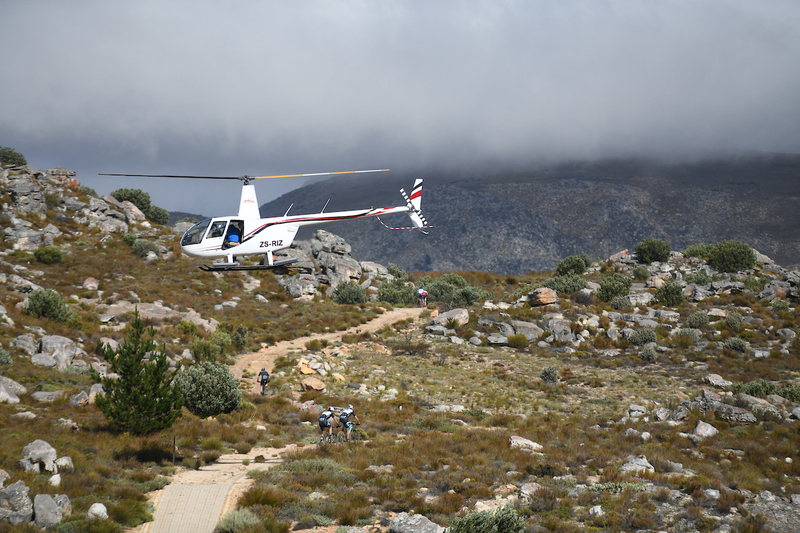 Hot, dusty conditions greeted more than 700 riders, including some of the world’s best mountain bike racers that tackled the 89km stage, which included a total of 1 990m of ascent through the rugged Kouebokkeveld landscape near Ceres in South Africa’s Western Cape province. 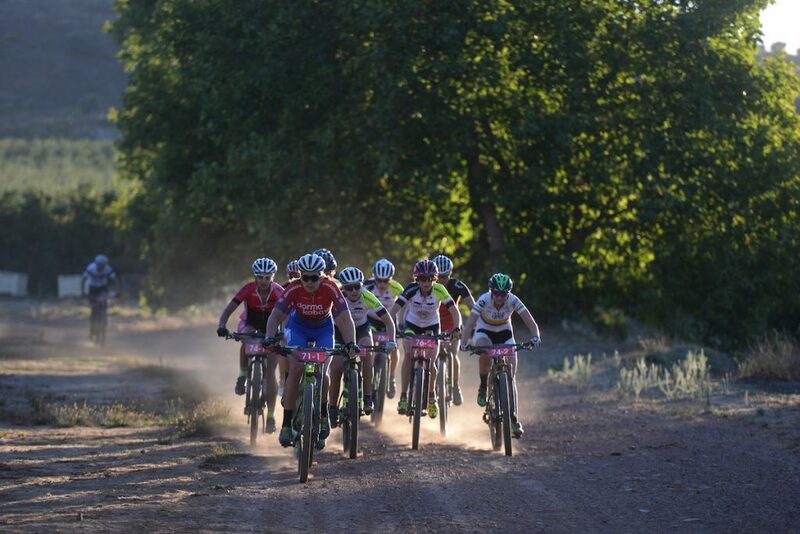 German Platt and Swiss Huber, who are also the current holders of the Absa Cape Epic title, were seldom far from the front of the lead group from the outset and responded with composure to a number of petulant early attacks. In the end though, it was their experience and combined strength that ensured they were able to ride clear of their rivals to clock a winning time of 03 hours 47 minutes 10 seconds. Runners-up more than two-and-a-half minutes later were the Swiss duo of Nicola Rohrbach and Lukas Flückiger (Goldwurst Power – BMC) in 3:49:51 with the Telkom BCX pair of Waylon Woolcock and HB Kruger third, just over four minutes after the winners. Two of the more fancied teams failed to make an impact on the podium. Last year’s overall runners-up, Swiss legend Christoph Sauser and New Zealand’s Under-23 XCO World Champion, Sam Gaze (Investec-Songo-Specialized) finished ninth as a result of Gaze struggling with illness during the latter half of the stage, while the Topeak-Ergon pairing of Alban Lakata (AUT) and Kristian Hynek (CZE) limped across the finish line in eighth place, both experiencing tyre trouble during the stage. “This was the first race for me this year. The start was fast and for the first hour I was really fighting and on the limit. But then I found a good rhythm and got stronger and stronger,” said Huber. 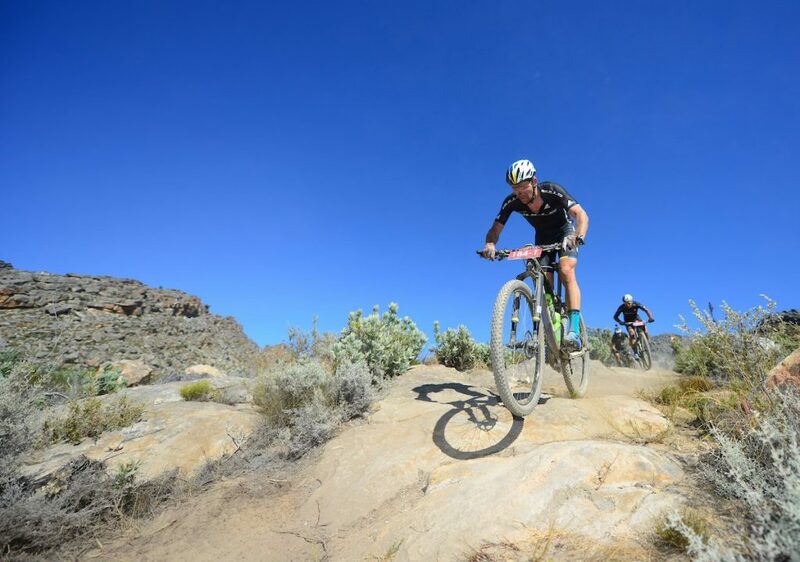 Waylon Woolcock (front) and HB Kruger on their way to third place on Stage 1 of the Momentum Health Tankwa Trek, presented by Biogen on Friday. “On the long climb in the second half of the race we got away a bit and managed to stay away to the finish. We are very happy to have won the stage. It’s a great start!” added the Swiss marathon champion. “We have a new bike this year and it’s very agile. I liked riding it hard on the front and pushing it. It was really fun and to be leading when the bike is feeling so good, you enjoy it even more,” smiled Platt, who was among the riders setting the rapid early pace. “Early on lots of young riders were pushing hard and taking their chances. For us it’s difficult because you have to stick with them because you don’t know who is strong and who might get away. But the older you are, the better your endurance. We proved that we are still there,” added Platt. In the women’s race, pre-race favourites Ariane Lüthi (SUI) and Adelheid Morath (GER) of Team Spur saw their hopes of a good result fade shortly after the start. Lüthi was ill and pulled out of the race at the first water point. That left early leaders, Stenerhag and Süss of the Meerendal CBC team with fewer rivals to consider. But the pair led for virtually the entire stage, crossing the finish line in a time of 4:24:46. The South African pairing of Yolande de Villiers and Mariske Strauss (OMX Pro) were second in 4:30:23 with the dormakaba duo of Candice Lill (RSA) and Vera Adrian (NAM) rounding out the top three in 4:39:34. Esther Süss (front) and Jennie Stennerhag led from early on and won the women’s category on Stage 1 of the Momentum Health Tankwa Trek, presented by Biogen on Friday. “We didn’t know what to expect. We wanted to be first into the singletrack, but it only came after a 10km so the start was really fast for me. Once in the singletrack we got a gap. I was a bit surprised Ariane wasn’t with us, but I wasn’t sure what her tactics were and she has to also ride with her partner. We just focussed on ourselves though,” said Süss. “After the third water point we heard we had a lead of about seven minutes. But we didn’t know who was behind, so we just rode as steady and hard as we could to stay in the front. We have a reasonable gap after stage 1, which is always good,” added Süss. “We had our own women’s start group which made it a different race for us. It was not as hard from the start as it would be with the men – a bit more tactical. After about 10km we got away in the first section of singletrack. We had a really good day, worked well together and really nice to get the win,” said Stenerhag. “We went as hard as we could without overdoing it. We still have two days to go so you have to find the balance. The trails on this stage were absolutely amazing! This is my fifth time here and it’s nice to see the new section, but I absolutely love it here,” added Stenerhag. Saturday’s Stage 2 is the Tankwa Trek’s Queen Stage. While at 87km it’s a little shorter than Stage 1, it’s got more climbing. 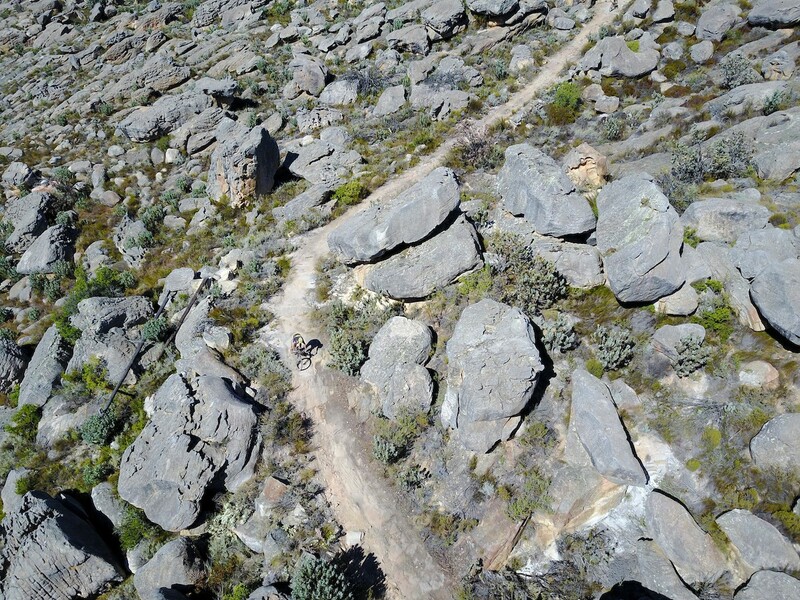 There’s a total of 2 200m of ascent with more than 1000 metres of that on just one climb, the massive Merino Monster. 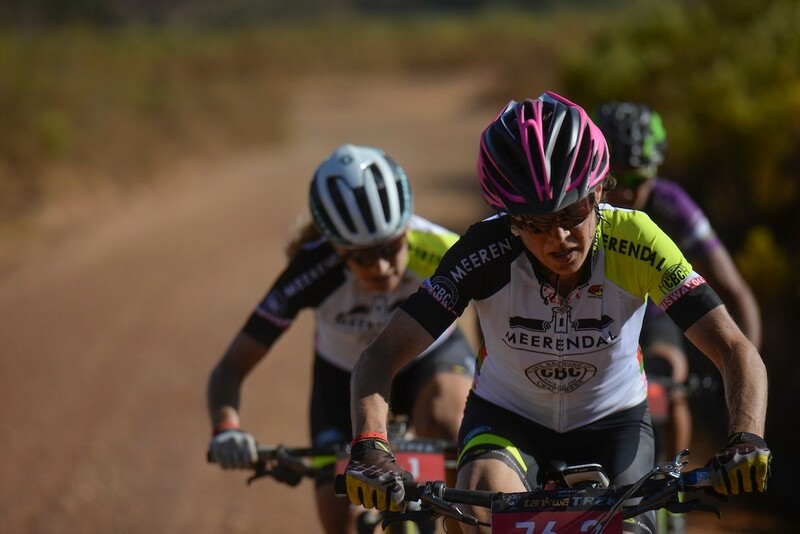 The Elite women had their own start group to ensure their contest was unhindered by other riders on Stage 1 of the Momentum Health Tankwa Trek, presented by Biogen on Friday. The 20km ascent starts just after 45km at around 700 metres above sea level and ends at 65km at 1750m above sea level. If the weather is clear, the views across the surrounding valleys are spectacular. The top riders are unlikely to have time to notice though and the Merino Monster is expected to shake up the general classification in most categories. “Tomorrow is the big climb. We saw today that we are in good shape so we are looking forward to tomorrow,” said Huber. “We will do our best tomorrow. We need to stay focussed with no falls. We need to be cautious to protect our lead,” said Süss. 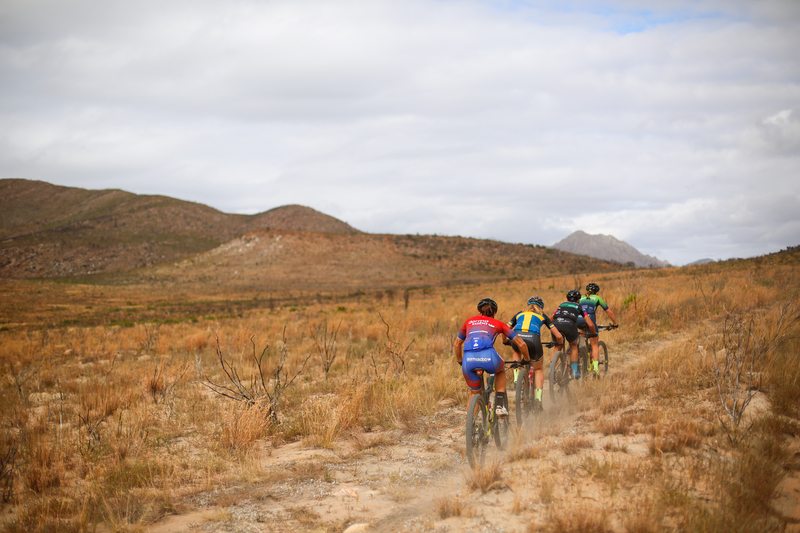 For live race updates, follow @TankwaTrek on twitter. The stage will start at 06h30 on Saturday. A rider makes his way through the rocky landscape during Stage 1 of the Momentum Health Tankwa Trek, presented by Biogen on Friday. 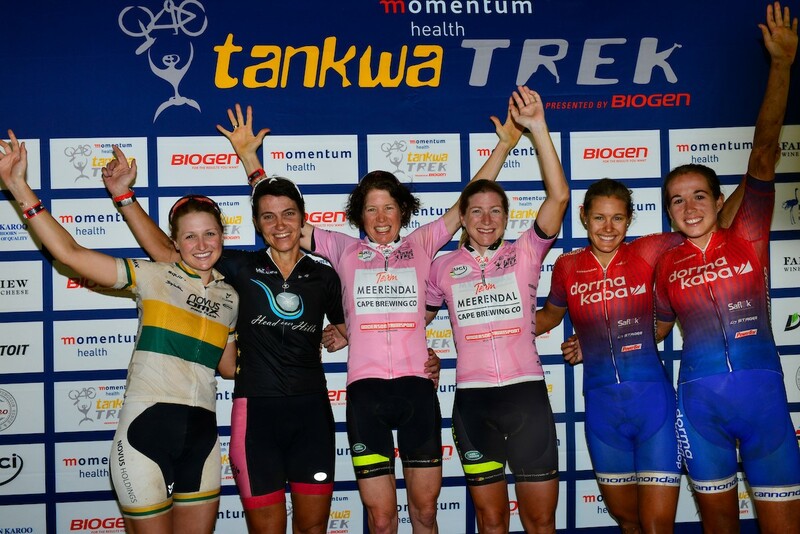 Women’s podium after Stage 1 of the Momentum Health Tankwa Trek, presented by Biogen on Friday. From left: Mariske Strauss and Yolandi du Toit (second), Esther Süss and Jennie Stenerhag (first) and Vera Adrian and Candice Lill (third). 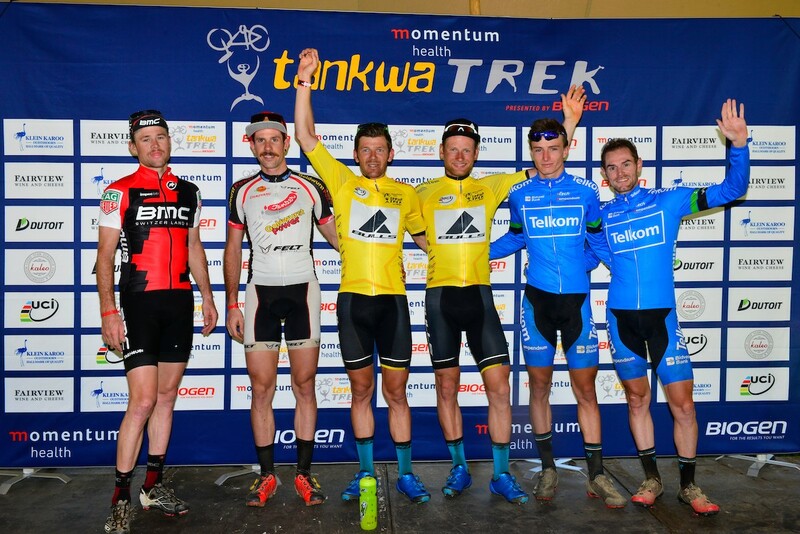 Men’s podium after Stage 1 of the Momentum Health Tankwa Trek, presented by Biogen on Friday. From left: Lukas Flückiger and Nicola Rohrbach (seconnd), Karl Platt and Urs Huber (first) and HB Kruger and Waylon Woolcock (third).